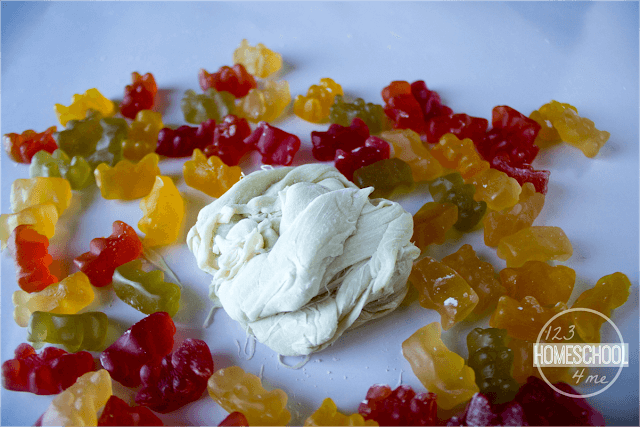 This amazing new slime recipe uses actual gummy bears to make this fun-to-play-with edible slime! 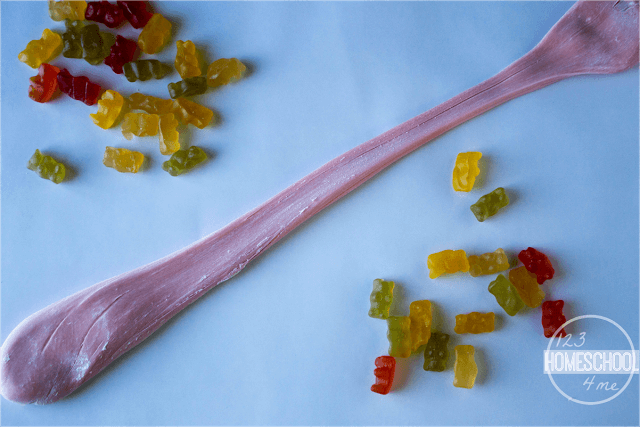 Are you ready to learn how to make Gummy Bear Edible Slime? 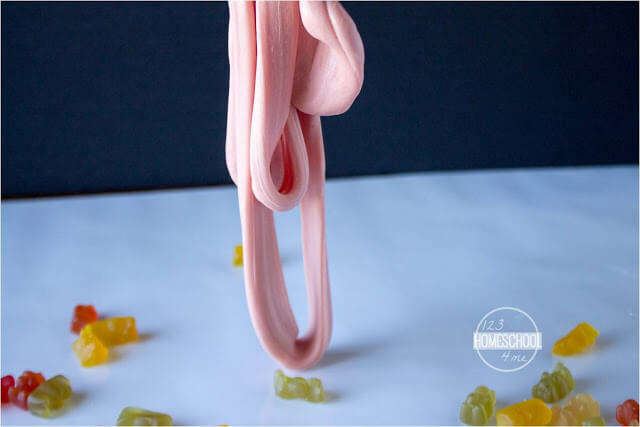 This Gummy Bear Edible Slime is made from a couple simple slime ingredients. First, separate gummy bears by color. This may sound tedious to us grown-ups, but kids LOVE sorting by color and it wonderful early math skill. Melt 1/2 cup of similar colored gummy bears in a microwaveable safe bowl for 15 seconds. Stir and microwave an additional 10 seconds if needed. 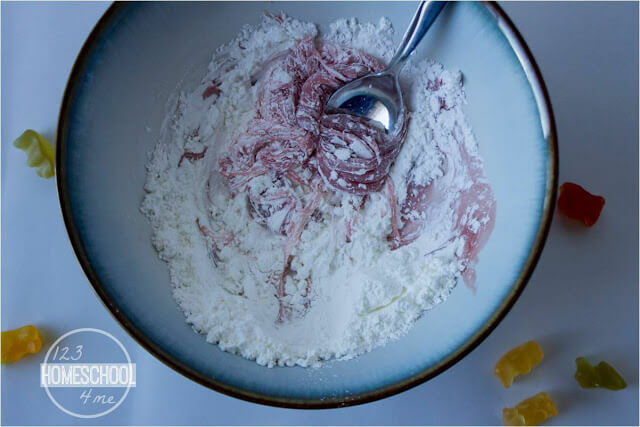 Add 2 tablespoons cornstarch and 1 tablespoon powdered sugar and knead with hands. If it is too sticky, add in additional cornstarch and powdered sugar. This edible slime is super fun-to-make and stretchy! 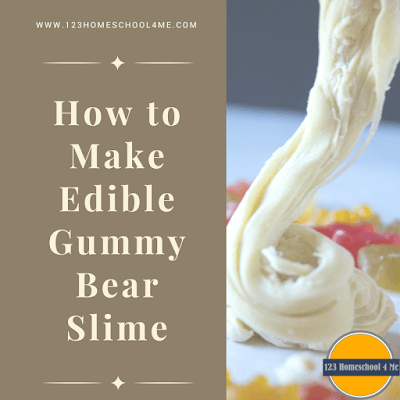 Feel free to repeat the process to make another color of gummy bear slime. Look how beautiful it looks as you play with the easy slime recipe that takes only a minute to make. 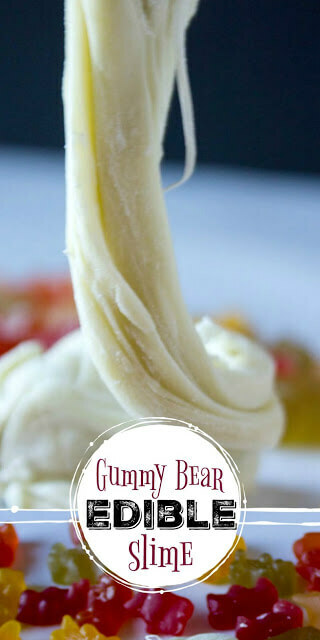 Add additional cornstarch to make the gummy bear slime more like gummy bear playdough. 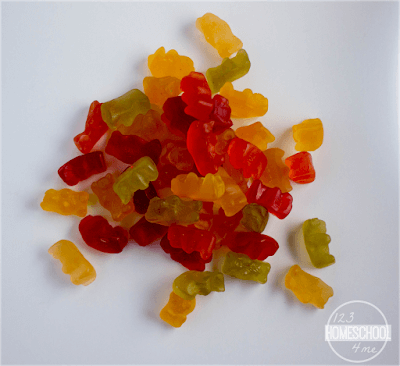 At any time, feel free to take a nibble and enjoy this gummy bear recipe – YUMMY! 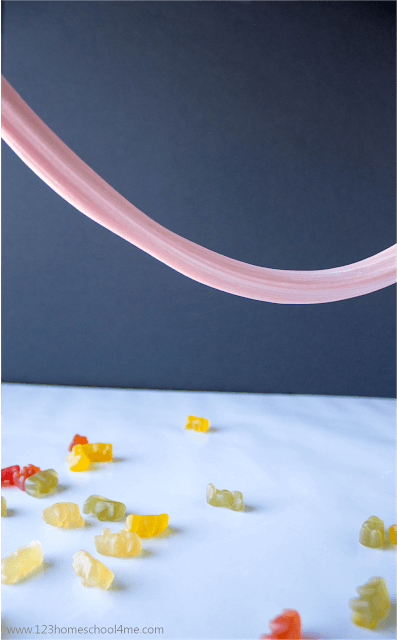 To refresh your gummy bear slime and make is smooth and stringy again, just zap it in the microwave for 6-8 seconds and you are ready to stretch and slime some more! Separate the gummy bears by color. You will make the slime by color. Melt the gummy bears by microwaving them in a microwavable bowl for 15 seconds; stir. You can melt for another 10 seconds at a time to get smooth consistency. Add 2 Tablespoons cornstarch and 1 Tablespoon powdered sugar. If it is still too sticky add 1-2 Tablespoons more cornstarch and 1 Tablespoon more powdered sugar. Kneed with hands. Now play, enjoy, and EAT – YUM!